COSTA MESA, California / Dec 1, 2009 / — Dakota Collective, the Westside Costa Mesa-based multi-brand retailer, is offering a VIP night of eco-friendly holiday shopping with organic wine and an exclusive EcoSkin trunk show, Friday, December 4th from 5 to 8 p.m.
Come sip organic wine and shop the exclusive racks of EcoSkin earth-friendly, fair trade figure-flattering clothing made from sustainable Chinese bamboo spun into a soft, silky yarn with Tencel and spandex. 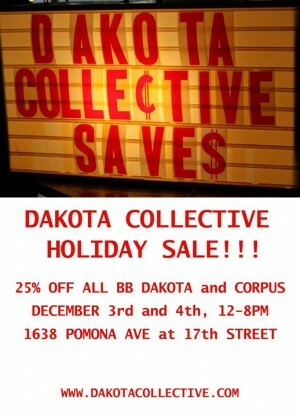 Additionally, cruise by the WeSC and Generic Surplus sample sale, being held next door to Dakota Collective Thursday and Friday starting at 10 a.m. Alongside the WeSC sample sale, Dakota Collective is offering 25% off on BB Dakota for women and 25% off on Corpus for men. Dakota Collective is located at 1640 Pomona Avenue near 17th street and will be holding the EcoSkin trunk show from 5 p.m. to 8 p.m. on Friday, December 4th.